Jonathan Kankolongo is a Law student originally from the Democratic Republic of Congo who moved to Glasgow aged 4. Jonathan reflects on his time at GCU and his experience with the GCU Advanced Higher Hub whilst still a school pupil. 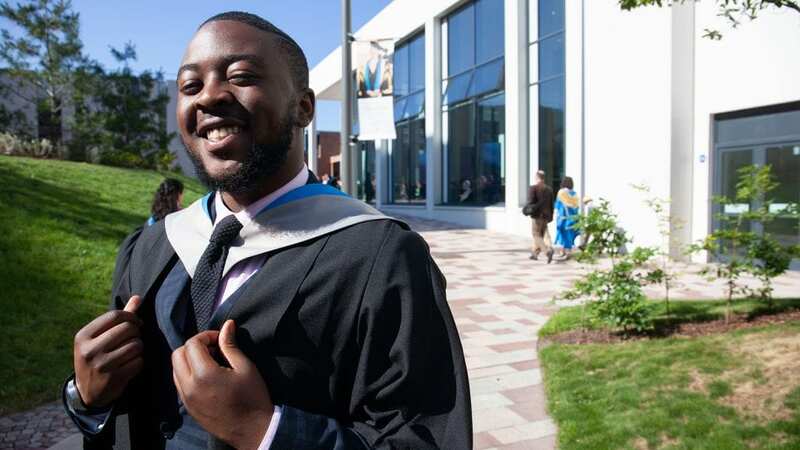 I joined Glasgow Caledonian University on the LLB (Law) course but in year 2, I was able to add the Risk component to my degree. I completed the next two years with this additional Risk component and today I graduate in the Bachelor of Laws with Risk with a 2:1. I chose to study Law because it was the subject area that I was most interested in. I knew if I did not want to go down the professional legal route, then I should study a course that enabled me to develop skills that could be put to use in another profession. By adding the Risk component I have been able to gain knowledge of other professions that I felt were compatible with areas of Law that I love the most. I really enjoyed the Law with Risk degree at GCU. A lot of the content is contemporary and I can see the real-world effects of certain concepts and principles that I was studying. It’s all more knowledge for me to put to good use. The most important thing for me was being a part of the first year of the University’s incredible Advanced Higher Hub when I was an S6 pupil. The Advanced Higher Hub let me develop skills and qualities that helped me during my first year at GCU. I felt more confident knowing I had a support system already readily available to me through the Hub team and the School Connect team. I’ve known these guys since S2/S3 through the outreach work they did at St Andrews’ RC Secondary School. This support greatly aided my acclimatisation to University life and I shall always be grateful to these wonderful teams, as well as all the outreach teams who do such a great job with other young people. No-one can achieve anything completely by themselves; no-one is ‘self-made’. There is always a need for that friend, family member, coach, mentor, teacher, inventor, leader etc. In this interconnected world, connections are key in order to progress. I acknowledge the help that I have received and I am always looking for the opportunity to help someone in return. I most definitely do. We live in a complementary world where everybody is blessed with different skills and abilities, experiences, insight where – I feel – we have a duty to share what we have with others in order to benefit the world. Today’s world feels like it can be very much ‘every man for themselves’ and we see the effect of this type of mindset in everyday life. However, if one person at a time recognises the skills they have are not there to simply enrichen their own lives but rather can become tools to improve the lives of fellow human beings, then the world would be a much better place. I believe the biggest aspect of the common good is love and particularly selflessness. If we just love one another then we are able to be selfless with our time, money, skills and so on. If we start little by little, then change for the common good may be achieved. Success takes its form in several different ways but in order to achieve it, there are certain fundamentals that are required such as hard work, dedication, commitment, sacrifice and ambition amongst a host of other things. A misconception that often exists is that you are not successful unless of course, you play for Real Madrid. I am inspired by these attributes that cause people to be successful, I am inspired when I hear of the struggles, the pain, the blood, sweat and tears that went in to form the successful person that the world now sees. I will also give a special mention to my parents. They have enabled me to grow up and see what it is to work through adversity. They made (and continue to make) lemonade from the lemons that life has given at them. Love you guys! Most likely at one of the tables in the refectory. There’s no particular reason other than the fact that I sat there once, and I found the seats comfortable. If not there, then I’d be on level four of the library for its silence.